My name is Michelle and I've struggled with diets and my weight my whole life. I discovered the Keto lifestyle about a year ago and have not looked back! I have lost over 100 lbs and it continues to drop off. Lot's of people ask me what I'm doing, what food I'm eating, where I get my recipes, how to start the keto lifestyle etc so I decided to share my journey with anyone who is interested in losing weight, feeling more energetic, clear headed and also lose weight. Where do you find your recipes: I actually have a background in culinary and baking and used to have my own bakery so I will usually invent recipes myself based on just regular foods I love to eat. Do you have to exercise? Only if you want to. Believe it or not losing weight is all about what you eat, not the calories you burn. Is there a vegetarian/vegan/paleo/dairy free etc option: Keto is very flexible and you can incorporate any type of food restriction. Just keep in mind that it will be more work because foods that are high in fat are plant/animal based. I actually follow a version that is mostly vegetarian without red meat. Can you eat fruit? The short answer is no. Fruit is actually packed full of sugar and not so great to eat in large amounts. You can eat some berries. What do you drink? Main answer is WATER and lots of it! Rough estimate is half your body weight in oz per day which is important for digestion when you're eating high fat foods. You can also drink other things with stevia as a sweetner like La Croix. Access to creative and delicious keto recipes! New recipe every week! Join me LIVE in our private Facebook group where I show you HOW to actually cook these delicious meals, answer questions live as well as give you the recipe. When we reach 500 patrons I will add a tier where I will mail out full color, step-by-step printed recipes each month. 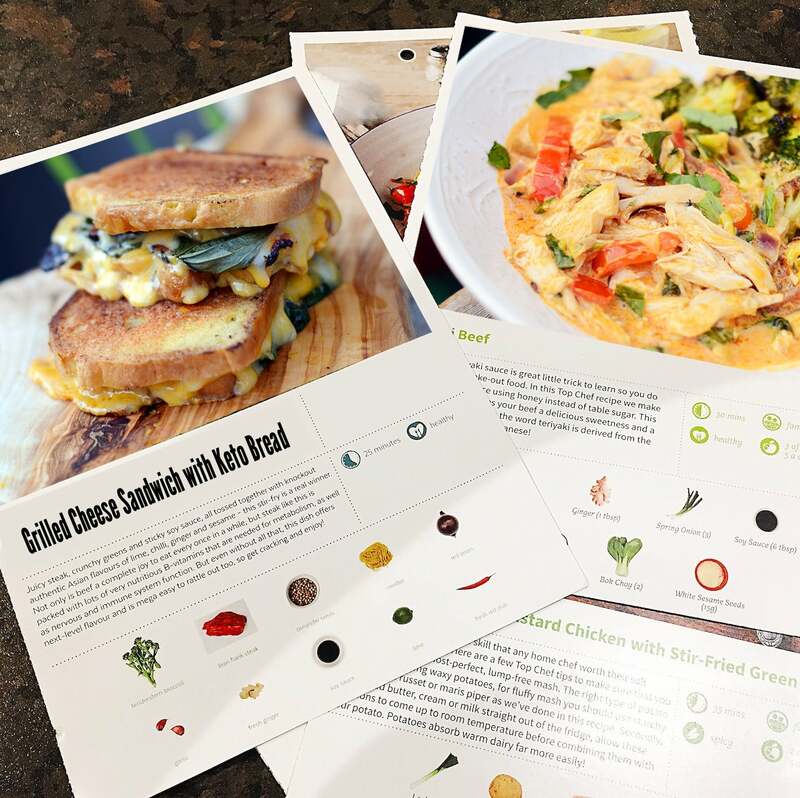 Your first recipe will come with a keto cheat sheet, binder to hold all your cards and a fun little gift.